It was one of those moments that I wish I had anticipated having my camera ready. The place was the venerable Canlis restaurant in Seattle. The occasion was very rare lunchtime gathering as the venue of choice for a trade gathering with Ferrari sparkling wines from the cooler northern region of Italy, the Adige Valley near the impressive Dolomite Mountains. And the moment was when the celebrated winemaker was told of a potential food pairing for his sparkling wine that he found, well, unexpected. The look of surprise blended with what I hope was a dash of delight was priceless. I had the good fortune to be sitting at lunch with said winemaker, Marcello Lunelli, to one side and the inimitable Jameson Fink to the other. We’d already enjoyed a brief wine tasting and discussion of some of their phenomenal vintage wines, including a few from the 1990s and the wonderfully complex Riserva del Fondatori Giulio 1986. I don’t believe I’ve ever sipped a sparkling wine older than 27 years of age and was honestly surprised how crisp and vivacious it tastes still at that age. Our lunchtime conversation bounced all over the place, but generally hovered in the territory of travel, wine and food. At some point, given my proclivity to gravitate toward snacks whenever I can manage it, I nudged Jameson about recalling that he’s got a favorite snack he thinks is perfectly paired with sparkling wine. So he turned to Marcello and told him of his penchant for partnering popcorn with sparkling wine. Which elicited that priceless reaction on Marcello’s face, responding with a “wow! really? popcorn?” expression. We chatted a bit about popcorn, apparently still relegated to just occasional indulgence at a movie house in Italy, while we in the States have embraced it much more wholeheartedly, well beyond simple buttered-popcorn snacking. The conversation spurred inspiration for Jameson and I to combine efforts and conduct a popcorn and sparkling wine tasting the following week. Of course popcorn showed up in my most recent book, Salty Snacks , in fact in three different guises: tossed with chili-butter, lime zest and cotija cheese; coated with a garam masala-spiced caramel and sprinkled with salt; and, more unusually, ground up to add salty-nutty accent to sweet meringues. It’s been fun to explore some of the versatility of popcorn! Jameson showed up the designated afternoon with a couple bottles of sparkling wine provided by the US importers of Ferrari–the brut (100% chardonnay) and the rosé (60% pinot noir, 40% chardonnay). 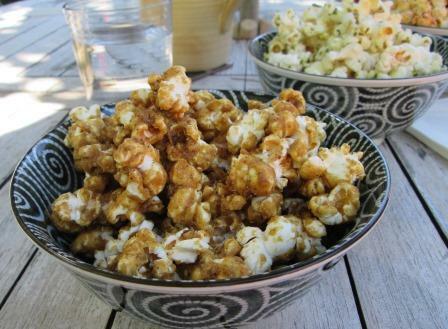 I’d made up three batches of popcorn, the aforementioned chili-lime version, the caramel-masala, and a sage butter popcorn from my previous book, Gourmet Game Night . As we sipped and nibbled our way through the wines, I found that the brut shone best with the simplest preparation, the sage-butter popcorn. It didn’t hold up quite as well to the bolder flavors of the other two popcorns, not bad pairings but the wine’s character just got lost. The hit of the afternoon, as Jameson recounted in this great post a couple of weeks ago, was the rosé sparkling with the caramel-masala popcorn. There’s a bit more earthy-robust character to that wine, which not only held up well to the distinctive flavor of the caramel but enhanced and brightened the spice flavor a bit. It was a very happy match! Ferrari has been one of the top producers of sparkling wine (they make no still wines at all) in Italy since 1902. These two non-vintage wines we sampled with the popcorn are affordable in that category ($27 for brut, $37 for rosé, recommended prices) and given the quality, offer great value per sip. Oh, and because you’re curious…there is, in fact, no relation at all between this sparkling wine and the dashing red sports car. Though despite the commonness of that surname in Italy, in those two examples it recalls products that are anything but common. Always love popcorn and bubbly!